Friday’s price action on the euro vs dollar once again confirmed the bullish sentiment that remains firmly in place for the currency pair as we approach the key technical level at the 1.48 price handle. Friday’s trading ended the session with a narrow spread down bar but one with a deep lower wick which suggests that the bulls are still firmly in control in the euro vs dollar and as such we should see a move higher early in the week. This view is reinforced by the fact that the low of Friday’s trading session found solid support from the intertwined 9 and 14 day moving averages, a positive and strong buying signal which suggests that the momentum of the past week remains firmly in place. The only issue now remains if and when we see a break and hold above the 1.48 price point, and once this has been achieved then our short term target of 1.50 will be clearly in view, with 1.55 as our medium term goal for the pair. 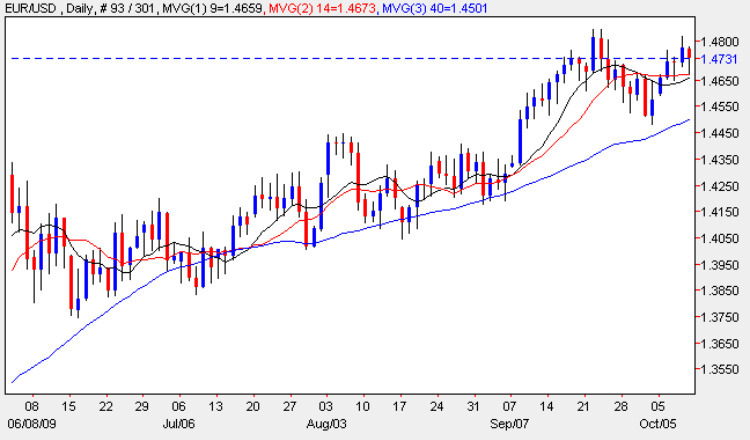 With all three moving averages pointing firmly higher and with the 40 day moving average providing strong support to the trend this move looks set to continue at the present time. With a national holiday in the US for Columbus Day there is virtually no fundamental news on the economic calendar for either Europe or the US with only the minor German WPI Data due for release. This second tier data set is forecast at 0.2% against a previous of 0.7%. With no news and consequently very thin trading volumes we should expect some random and unpredictable price moves until normal service is resumed on Tuesday.